Oregon Democrat says at Beaverton town hall meeting that firearms restrictions must be coupled with greater access to counseling, improved security on campuses. U.S. Rep. Suzanne Bonamici says student safety will be enhanced by a combination of restrictions on firearms, increased access to counseling and improved security in schools. The Oregon Democrat was asked about the issue four times during an hourlong town hall meeting Saturday, March 10, at Conestoga Middle School in Beaverton. "There are a lot of things we can do, rather than saying that kids have to go to schools wearing bulletproof vests," she said to an audience of about 80. "They are already in fear right now." Although she expected some of the questions — two were asked by women in red T-shirts identifying them as Members of Moms Demand Action for Gun Sense in America — a senior from Lincoln High School in Portland also raised the issue as part of a plea for greater youth involvement in politics. Days after 17 people died in a Feb. 14 shooting at a high school in Parkland, Fla., Bonamici said "this time feels different." She said after the town hall that her view has been reinforced. "We've seen Florida (lawmakers) pass a bill that the governor signed, the private sector is making changes, and we're hearing conversations about bipartisan support," she said. "I mentioned one of my Republican colleagues (Brian Mast of Florida, an Army veteran of Afghanistan) is saying we need to look at reinstating the ban on assault weapons. "I am not surprised that so many people ask about the violence because they are very concerned about it." Lisa Li of Beaverton, who is a local leader of Moms Demand Action, asked about a 1996 ban on research into gun violence by the federal Centers for Disease Control and Prevention (CDC). Bonamici said the day after the Florida shootings, Health and Human Services Secretary Alex Azar testified to a House subcommittee that he interpreted the law more narrowly so that the CDC could do research but not be an advocate. "We should make sure that CDC can do that, because I am sure it would be very useful to know what is the best way to prevent gun violence," Bonamici said. After noting that she had spoken that morning with an emergency-room physician about gun violence, she added: "We should be able to do the research on what works." The subcommittee was part of the House Energy and Commerce Committee, whose chairman is Oregon Republican Greg Walden, and Oregon Democrat Kurt Schrader is a member. "She is a strong advocate for prevention of gun violence,"Li said afterward about Bonamici's response. "I was really heartened by what she said about talking to our representatives on that committee who can make a difference with the CDC." 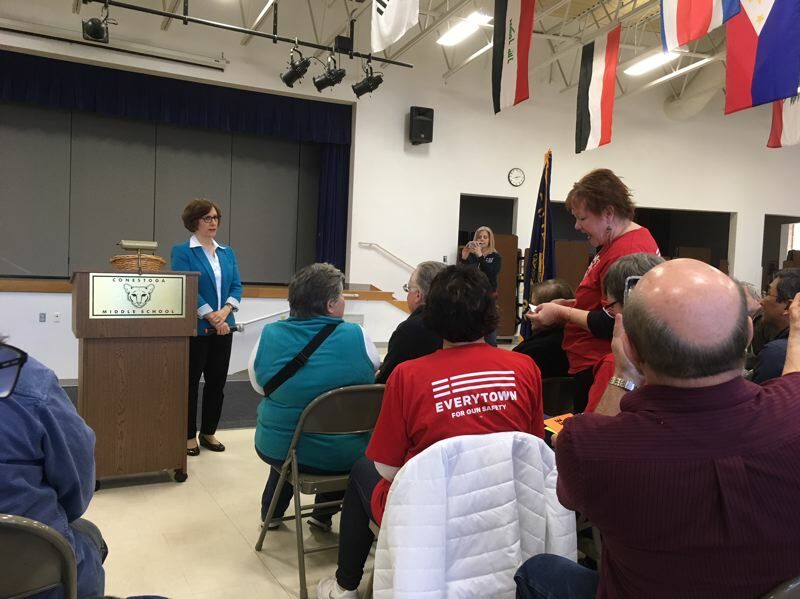 In response to another question, Bonamici said she would support broader criminal background checks in federal law — Oregon law already covers gun-show and most private transactions, excluding families — and a ban on devices such as bump stocks that greatly increase the rate of gunfire. Oregon law also allows police or family members to seek court orders to temporarily take away firearms from those deemed at risk of harming themselves or others. A bill just signed by Gov. Kate Brown extends a ban on firearms possession by some domestic abusers. But in response to a question by Sharri Anderson, who leads the Hillsboro chapter of Moms Demand Action — a group Bonamici spoke to on March 2 — Bonamici said other steps need to be taken. "My question is: How do we keep schools safe without arming librarians and janitors and teachers?" Anderson asked. Bonamici said schools need security plans and more counselors. "We need to make sure there is a procedure that there is somebody who is at the school at the front door, that people can't just come and go," she said. "We need to have more counselors. We need to make sure that students who are troubled can speak up and have someone to talk to. If you look at most of the school shootings … most of the school shooters had some kind of connection with the school. Obviously they are in trouble, so we can see how to intervene." But without the firearms measures, she added, "otherwise we are not going to close the gap." The U.S. House is scheduled this week to vote on a bill (HR 4909) that renews a 2001 program by the Justice Department to enable schools to get grants to strengthen security. There are no gun provisions in the bill. Speaker Paul Ryan has said the House is unlikely to take action ahead of the Senate, where various proposals for gun control were voted down in 2013, just months after 2012 shootings left 26 dead at Sandy Hook Elementary School in Newtown, Conn.